Michael Grayson is an Analyst at Vivaldi Capital Management focused on supporting all aspects of the investment management efforts with respect to the firm’s traditional and alternative investment strategies. 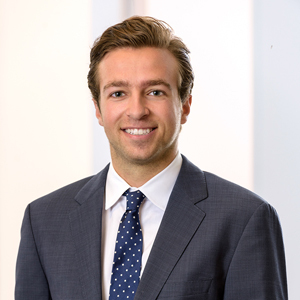 Michael helps manage the firm’s investment due diligence work-flow processes through participating in ongoing calls and meetings with existing and prospective managers. He is responsible for compiling and disseminating that information in support of the firm’s clients. Michael is also a regular contributor on WGN’s business radio segment and TD Ameritrade Network’s “Closing Bell” TV show, relaying personal and firm views on how markets are moving, what’s driving them and how investors are reacting. Prior to Vivaldi, Michael spent two summers working as an intern for a Private Wealth Management team at UBS Financial Services. Michael holds a B.A. from Colgate University where he studied Political Science and Economics. Michael was also a member of the Men’s Division I Varsity Golf Team and was nominated to the Colgate Athletic Leadership Academy. Ready to learn more about Vivaldi’s approach to managing wealth? Vivaldi Capital Management, LLC (“Vivaldi”) is an SEC registered investment adviser with its principal place of business in the State of Illinois. Vivaldi and its representatives are in compliance with the current notice ling and registration requirements imposed upon registered investment advisers by those states in which Vivaldi maintains clients. Vivaldi may only transact business in those states in which it is notice led, or qualifies for an exemption or exclusion from notice ling requirements. This web site is limited to the dissemination of general information pertaining to its investment advisory/management services. Investing in the stock market involves gains and losses and may not be suitable for all investors. Any subsequent, direct communication by Vivaldi with a prospective client shall be conducted by a representative that is either registered or qualifies for an exemption or exclusion from registration in the state where the prospective client resides. For information pertaining to the registration status of Vivaldi, please contact Vivaldi or refer to the Investment Adviser Public Disclosure web site (www.adviserinfo.sec.gov). This site may provide links to other web sites. Third parties, over whom Vivaldi exercises no control, maintain these web sites. Vivaldi expressly disclaims any responsibility for the content, accuracy of information, and availability of and/or quality of products, services or software provided by or advertised on any third-party web sites. If you leave this site through a hyperlink, or any other means, you do so at your own risk. Vivaldi is not responsible or liable for any content or other materials on or available through such sites or any losses related thereto. For additional information about Vivaldi, including fees and services, send for our disclosure statement as set forth on Form ADV. Please read the disclosure statement carefully before you invest or send money.